I’m building an arcade setup using a normal arcade joystick and buttons (kit w/buttons&usb controller) - not a gamepad. I’m playing games like Joust, Zaxxon, Dig Dug and am using lr-mame2003 with RetroPie. Many of the old arcade games have the joystick in the middle, with a fire button on BOTH sides of the joystick. Pressing either fire button fires, so both of the buttons do the same ‘function’. Any ideas for how to make a “fire1 fire2 joystick fire1 fire2” button arrangement? You’ll have to do it through the quick menu > controls remapping menu. There, you can cycle through each of the core’s functions on any given button, so if you want “jump” (say, “core function 2”), you can cycle to that same function on more than one physical button. However, I don’t think you can mix and match P1 and P2 buttons, as they are discrete devices. Maybe I’m missing something, but when I go into the control remapping menu, the left side is only the function (fire), and the right side is the adjustable button parameter. That means that there is only one option for fire listed in the left column. What I need, in essence is for those two columns to be switched, where the unchangeable column is the button number, and the changeable one is the function (fire/a/x/etc). 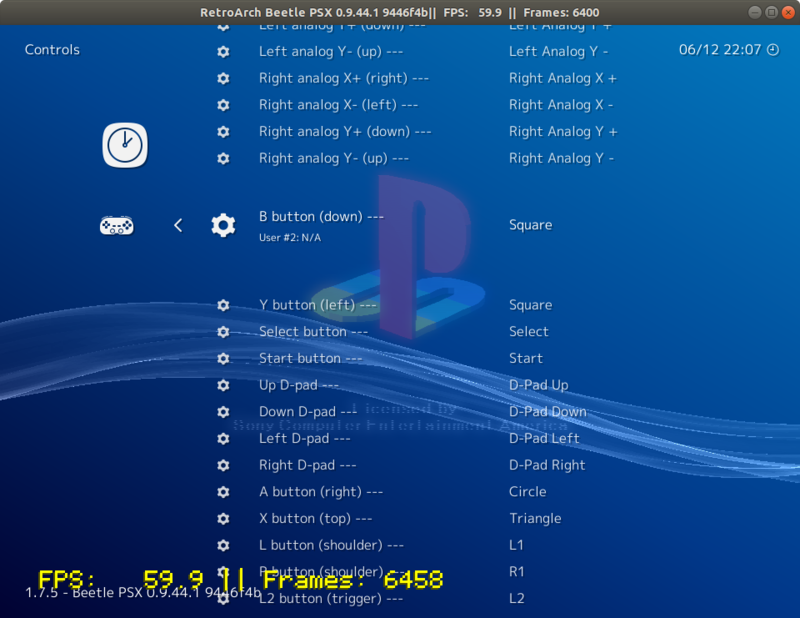 I have 1.7.5 of retroarch installed, with mame2003/0.78. I think that your platform for retroarch works differently than on retropie - or I’m in the wrong part of retroarch (I’m new). It appears that what you are showing is what I’m looking for. In yours I think the left side are your controller’s buttons and the right side (the variable) are the functions it does. In mine, the left side are the functions and the right side are the controller’s buttons (variable). So - I’m unable to say make “L2 button (trigger)” be button 8 and “L2 button (trigger)” be button 9. I’m really looking for a way for the physical buttons to be constant, and the function be a repeatable variable. So - I’m unable to say make “L2 button (trigger)” be button 8 and “L2 button (trigger)” be button 9.
this is the opposite of what you were describing as the goal. You don’t need L2 to be 2 different functions, as that would make both of those functions trigger whenever you pressed L2 (i.e., a macro, or “one to many”), which isn’t possible in RetroArch. What you were describing is having multiple buttons with the same function (i.e., “many to one”). So, looking at your screenshot, it appears your input device shows up as a keyboard, correct? So, you have the one selected that triggers “key: x” and its current function is Button 4. If you press left/right while it’s selected, Button 4 should cycle through the other buttons that the core exposes. If “fire 2” is Button 3, you already have “key: s” as Button 3, so cycle “key: x” to Button 3, as well, and you’re set. My controller isn’t a keyboard, but rather a USB joystick. Did you try the steps I described? So, you have the one selected that triggers “key: x” and its current function is Button 4. If you press left/right while it’s selected, Button 4 should cycle through the other buttons that the core exposes. If “fire 2” is Button 3, you already have “key: s” as Button 3, so cycle “key: x” to Button 3, as well, and you’re set. Ignore the part about keys, it’s just to identify the physical button (i.e., the ones on the left). The core’s buttons are on the right. correct, you can’t do it through the config file or settings > input > p1 input binds, only in quick menu > controls. It would be nice if we could mix and match P1 and P2 buttons, only for Perfect Dark and Goldeneye (you can use P1 stick for movement and P2 stick for direction, in a true dual analog setup). This is possible with standalone emulators. Apologies - took a while to get back to this. So - I followed your directions and it worked - thanks! I was able to get two buttons matched up (different physical, same function) - but basically through trial and error, and I’m not sure I could recreate it from scratch. I’m pretty confused about how to know what the function maps to in the game. If, say for Missile Command, I knew what key the three fire buttons were referenced as, then I could go and set the physical button numbers. So - that’s where I am now. Some of the cores will adjust the button labels dynamically to match the game. E.g., instead of ‘button 1’ it will say ‘jab’ for Street Fighter. I think FBA does this, and maybe mame2003-plus…? 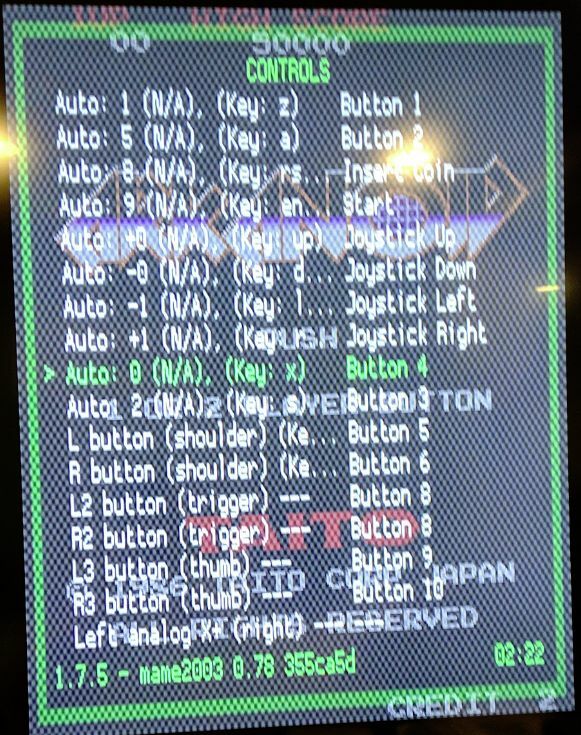 Yes there are button names in mame2003-plus for many games. We’re still in the process of adding the button names and volunteers are welcome! I do this function using Xpadder. Basically I map L2 to Left Trigger and the X key in RA, then I map the X key to R2 in xpadder. Gives me 2 Z-triggers on N64. Great! A bit of a learning curve, but I’m all set now. I moved to 2003-plus and the button names helped a lot. One side question. The only way I could figure out how to add the 2-player start button (to have 2-player play) was to add a 2nd USB controller. I have just one button connected to it - the 2nd player start. Is there a way to simulate the 2nd player start button on the 1st player controller? Not a big deal - just more junk and wires in the box. No unfortunately at present you can not map buttons on more than one physical controller to a single RetroPad. That comes up as a request on a somewhat regular basis – @hunterk do you know if there is a github issue already started to request it? Not that I know of. I just did a quick search and didn’t see anything about it, but it’s hard to find specific issues sometimes.